Planning an end of the year celebration can be a great way to include parents in the results of the school year. Some schools have curriculum fairs while others have family picnics or parties. If you would like to include your students’ families in on the festivities, keep the five steps below in mind to help you get (and keep!) things organized. Instead of worrying about sending paper invitations, if you communicate with parents’ via email, send an evite. An electronic email invitation will make it easy to track who is coming and who cannot attend. It will also save you time creating invitations and save you money since mailing them will not be necessary. At the end of the year party, parents will most likely want to see what their child has created and been working on. Now is the perfect time to gather those loose papers and portfolio work to send home on party day/night. Have students help you organize the papers and projects so that they can share them with their families and be prepared to take them home when the celebration is over. Parties where families are invited should definitely have an agenda. It can be as simple as allotting time for a welcome, portfolio review and class tour, and refreshments, but it will give parents and students an idea of what is expected and when. Keep the agenda posted on the white board for all to see. A party or celebration is just not the same without refreshments. Be sure to assign one or two parent helpers to assist you with planning for and preparing refreshments. Make the cut off RSVP deadline a week before the event so that enough treats can be prepared. 5. Put on Your Party Hat! 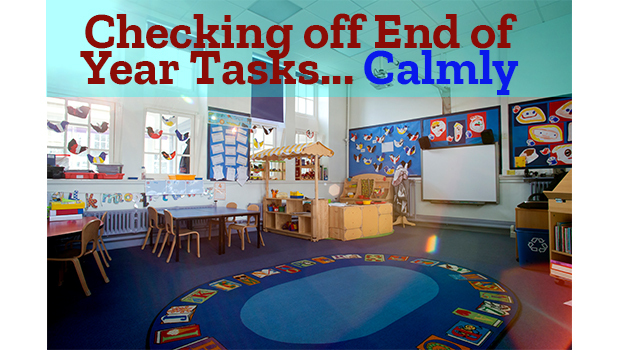 It can be easy to get caught up in the hustle and bustle of the end of the year, but take the time to really enjoy the accomplishments of your students. Have fun! Rootbeer Floats, Bubbles, Chalk, and Relay Races equal a great end of the year party! I had a portfolio party. The kids had on display their most recent two projects…an eagle project and a just-for-fun diorama from Indian in the Cupboard. They also presented their writing portfolios to their parents. We did it with an open house format and served brownies. Our kindergarten team always puts on an end-of-the-year musical which features 12 songs representing something we learned each month. 2 of us also throw a Hawaaiin party, with pizza, make-your-own-sundaes, and games, like pin the nose on the shark,put-put golf, and octopus ring toss. Then several of us always put together a scrapbook of their best artwork and papers from their portfolio. 2 of my teammates create photo journals for each student. By the last day of school, we’re exhausted, but the kids and parents are thrilled. We spend the year studying Texas history…the best way to end the year is with a good ol’ bar-b-que! We begin with a parade through the halls to show off our history projects. Then fill in around the BBQ lunch with a variety of games and crafts. We spend the day signing each others yearbooks and reflecting on the most fun things we have done during the year. Since I have to move rooms my kids have genrously offered to helpe move some of my things. Portfolios are a big thing…..and tieing up all the on-going projects! Finding a way to get these anchor chart posters and folders home safely can be a chore. I have found that if you go to a local store where their brown bags have handles you can make a really neat looking “bag portfolio.”. This bag can have a typed message from the teacher to sum ip the year and explain the contents of the bag. Students can decorate the other side. Our state’s second grade curriculum is the studly of plants so we make hand print flowers which are a neat reminder of their size at this time in their lives. Big and small projects fit nicely. Books and folders fit and nothing gets dropped on the way to the bus! We do a beach theme-luau style party with water games, beach balls, bubbles, and limbo. we also spread our beach towels out and have a picnic. We also do an ice cream week right after testing where we make ice cream different ways each day. There are 6 1st grade classes joining together for a luau inspired theme. We will have craft and activity centers inside and out. We did it last year with 4 classes so hopefully 2 more will work out fine. One neat homemade craft is to collect milk jugs, cut the bottom off and you have a scoop. We give them small splash balls they can throw and catch. Today we had field day and I took a lot of pictures which will be added to the photos I have taken all year long. I will make an end of year slide show to be shown on the last day when we have our pizza party. My team liked my suggestion for using the cute autograph photo frame from ReallyGoodStuff as an end-of-year gift to our students. With 4 teachers splitting the cost of the frames and the pictures, we are spending less than $1.00 per student! At the beginning of the school year my students made “portfolios”. These are made by folding a piece of posterboard in half and stapling it up the sides. The students personalized them by drawing and coloring on them. Over the year, I have filed writing samples and artwork in their portfolios. I have kept these tucked away so on the last day the students will enjoy seeing how they have changed and progressed over the year. Finally, the last day will be spent reflecting and enjoying each other before we embark on our summer vacation! We will be having a monkey themed party. My 5th graders are crazy about theme. Pin the banana on the monkey, monkey word searches, frozen banana treats! we are having our party on one of our 1/2 days with ice cream sundaes! We have Family Math Night. Parents & students can practice playing math games with materials that are easy to find at home (dice and playing cards). Then they can play these game during the summer to keep up with their math facts. My room parent is planning our party. We invite parents and play games. Fun Stuff! Only 17 more days! I have a tradition for the kids to paint and decorate their own t-shirts every year to wear for the last day of school. We pick a theme each year, and with p aint and fabric markers my 5-6 year olds become designers. A priceless way to keep their work and a fun and memorable memory! The party is to have a fashion show with all the tshirts a we give out awards. This is my last year in 3rd grade. We are going to have a pajama party with the theme “where dreams can come true”. We have a week long celebration the last week. I do a “going camping” themed day. I bring in my tent, we make s’mores, sing songs, read stories in the tent, turn off all the lights (they bring in flashlights) and we read stories in the dark. I do an olympics themed day. Kids are involved in different olympic games all day (long jump, javelin, etc…) On the last day I have the students bring in game boards and we play board games, eat pizza and snacks, and watch a slideshow from the year. The kids always love seeing themselves in the slideshow. It’s a great way to end the year! Ice Cream sundaes!! A cool treat for our end-of-the-year party!! The end of the year is difficult enough, without party planning. It’s nice that there are ideas to make it easier and the Dr. Seuss theme is really cute!